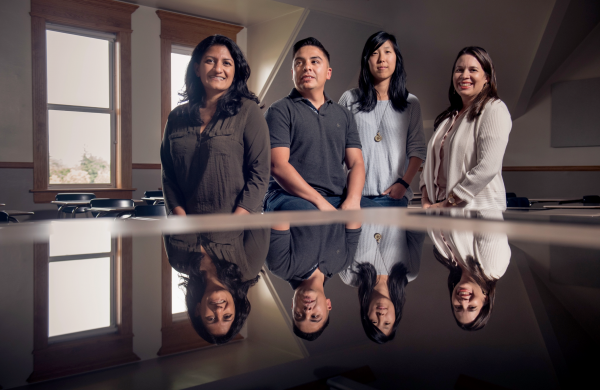 Gonzaga students have made it clear they want – and need – greater diversity among their faculty members to broaden the intercultural learning they experience. Now, thanks to a partnership with the University of Washington, that’s happening. Learn more about UW’s Diversity Fellowship program here. Kim is one of four UW diversity post-doc fellows teaching at Gonzaga following completion of their doctoral degrees at UW. Tony Abeyta (biology) and Noralis Rodriguez-Coss (women and gender studies) started their two-year appointments last year, Kim (classic civilizations) and Shruti Patel (history) new this year. Their impact has been appreciated by Gonzaga students. And the fellows appreciate what they see in Gonzaga students. The experience is impacting the new teachers, as well. Rodriguez-Coss is flowering as a teacher. “Gonzaga sparked an interest in me to foster a learning environment based on human dignity, care and solidarity. The classroom has the potential to be a space for the prevention of all forms of oppression and for raising social justice consciousness,” she says. After teaching a year at Gonzaga, I have reconfirmed my love for teaching. This group of post-doc fellows has bonded well. And their contributions are many. “Tony is taking two students to a national biology conference to present their research. Nora has introduced international feminism, which is a specialty we have not had in women and gender studies. She’s preparing students to be global citizens,” Maucione says. “After teaching a year at Gonzaga, I have reconfirmed my love for teaching,” Rodriguez-Coss says.